Japanese Episode AG 040: "Kinsetsu Jimu! Tessen no Dengeki Batoru!!" American Episode 312: "Watt's with Wattson"
Satoshi has arrived in Kinsetsu City! The young trainer wastes no time and quickly finds the gym, but is surprised when the gym's interior resembles a funhouse! The gang soon encounters a mechanized Raikou, but Pikachu is able to quickly dismantle it. The Kinsetsu City Gym Leader, Tessen, finally shows himself and accepts Satoshi's challenge to a gym match. Satoshi's Pikachu is able to make a clean sweep of Tessen's pokemon, knocking out his Coil, Biriridama, and Reacoil with only one attack each. Tessen gives Satoshi the Dynamo Badge right before Satoshi notices that his Pikachu has a very bad fever! 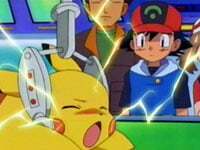 The Joi in the city's Pokemon Center tells Satoshi that his Pikachu's illness is caused by it being overcharged, and the gang is able to deduce that Pikachu received the extra jolt of energy when it fought the mecha Raikou. Satoshi, believing that his pokemon's super-charged status should negate his Gym Battle, begins a search for Tessen to return his badge. Tessen, meanwhile, is out by the city's abandoned power plant, thinking that his crushing defeat is a sign that he should resign as a trainer. Just then, the Rocket-Dan appear to steal all the pokemon in the power plant! Satoshi and his friends arrive on the scene, and everyone works together to thwart the trio. After the battle, Satoshi tells Tessen what happened, but the old Gym Leader decides to let Satoshi keep the badge anyway. Satoshi celebrates the acquisition of his third Houen League badge as Tessen, along with a new Rakurai, bids him farewell. After Satoshi's second Gym Battle got dragged out so much, I think the anime producers decided that it would be better to rush through the next match rather than take it slowly. While it is a bit unfortunate that Tessen suffered such a staggering loss, in the end I think it helps the series' pacing. Besides, Tessen will get his day in the next season. This was the season finale for the dubbed version, ending Pokémon Advanced. As far as the dubbing goes, it was pretty uneventful. Raikou's name was consistently mispronounced (the o sound is supposed to be long, like in yellow or Taillow), but other than that there isn't so much to report. The mechanized Raikou keeps its Japanese voice. Two seconds are cut right after the main commercial break. Wattson: "And I must confess, I never thought I'd see the day when my Electro-Raikou was turned into a pile of scrap metal!" Watt: "Mister Wattson, I thought you said our Electro-Raikou was too damaged to use anymore and you were going to toss it out." Wattson: "Yes, Watt, that was the plan, but its roar reminds me of my sixth grade teacher so I couldn't let go." The dub makes it sound like Wattson just repaired the mecha Pikachu destroyed to face Team Rocket, but in the original version there were actually two mecha Raikou. The first mecha, the "Electric Mecha Raikou-kun #02," is the one Pikachu destroyed inside Tessen's gym. The second, the one that faced off against the Rocket-Dan, was the "Electric Mecha Raikou-kun #01." I don't know why the dub would make this little change, especially when you consider that there most likely wasn't enough time to repair the mecha Raikou.